You can listen to my conversation with her in podcast episodes 17, 18 and 19 and find her on Instagram at #allaboutitalian. In the first part of our conversation, you’ll hear Elfin talk about her parents who met in Paris. How romantic! Both of the them had come to France from other countries. You’ll find out which ones and if Elfin believes there is a “language gene.” Do you think some people can learn languages easier than others because of their genetics? I hope to be this friend from Italy that is sending them little postcards and just letting them know that this is all waiting for them. practice while you’re doing something else like brushing your teeth or washing the dishes. connect it to something that you already do, like eating breakfast. have a “secret weapon” for getting you through the tough times. Italian chocolate with poetry, anyone? When I heard Elfin talk about her ten-minute rule, I laughed a bit and then took a serious look at how I’m spending my time. Well my rule is ten minutes. Find ten minutes. if you can’t manage then you don’t need to have a conversation in another language, you need a conversation with yourself. There’s something wrong, you know, in your life. I hope you enjoy these episodes as much as I did. I’m thankful for the way Elfin inspired me to find more time for my own language study. It’s something that I do to exercise my brain, to understand and connect with people, and simply because it makes me happy. If you’d like a transcript to help you understand our conversation, please subscribe to my email list. I put selected transcripts on a subscriber only page. Resources change monthly and you’ll receive a password and link at the beginning of each month. If you have suggestions for lesson guides or questions about any of the podcasts or other materials, please contact me here. 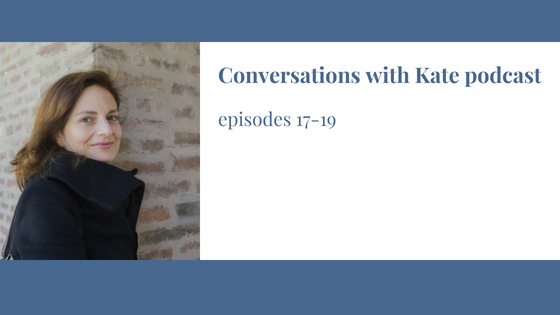 My conversation with Elena Mutunono Conversations with Kate is on Patreon!